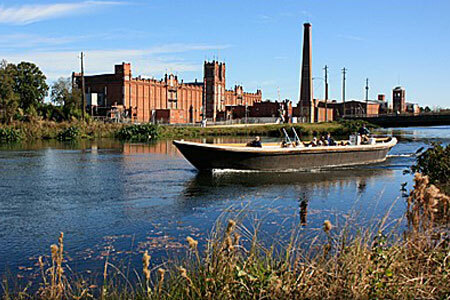 The Augusta Canal was built in 1845 as a source of power, water and transportation. It is the only intact industrial canal in the American South in continuous use. During the Civil War it was the site of the Confederate States of America Powder Works complex. Deepened and widened in the 1870s, the canal brought an industrial boom to the city, especially in textile manufacturing. The Canal and its mills were listed on the National Register of Historic Places in 1975 and declared a National Historic Landmark in 1978. The United States Congress designated the Augusta Canal and nearby land a National Heritage Area in 1996. Several canal-side structures pre-date the Civil War while others date to the later 19th Century and the heyday of America's Industrial Revolution.